What would you do to win your freedom? This is the question that sets bondwoman, Martise of Asher, on a dangerous path. In exchange for her freedom, she bargains with her masters, the mage-priests of Conclave, to spy on the renegade sorcerer, Silhara of Neith. The priests want Martise to expose the sorcerer’s treachery and turn him over to Conclave justice. A risky endeavor, but one she accepts without hesitation–until she falls in love with her intended target. So, as you may know, I’m kind of on a Draven kick right now after finishing Radiance. And let me tell you, she didn’t let me down with this one. First off, let me get my nitpicks out of the way so we can focus on the good. The good definitely outweighs the bad. It was great. The characters are complex and deep, though I would have liked to see more from Martise. I really enjoyed their weird little angsty romance, especially after the angst-free romance from Radiance. The side characters were fantastic, too. Once I had the worldbuilding under control and understood it, I did appreciate how it all came together. It was just a little rough getting there. Draven writes beautifully, and I love how effortlessly the conversation and wit flows. I found myself laughing out loud in some parts, which is refreshing. Overall, I would definitely recommend Draven’s work to those who enjoy fantasy and romance. 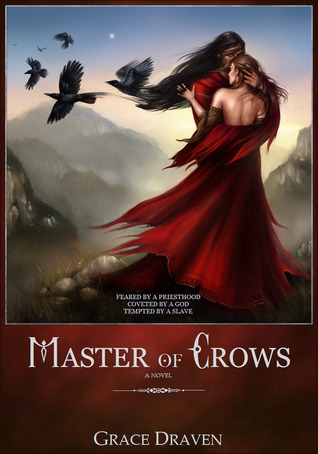 I rated Master of Crows 4/5 on Goodreads.